The Journey through the Clouds Excursion is a short trip packed with features. It’s strength is that you see all the highlights of the Canadian Rockies in a short trip. 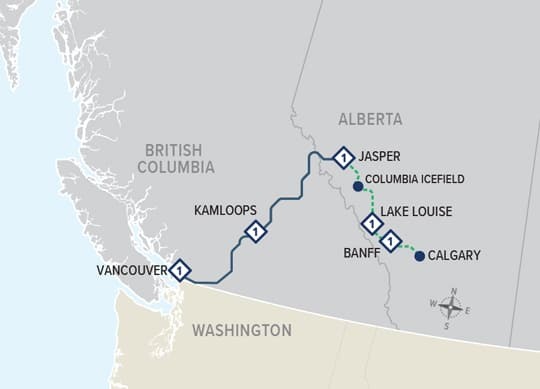 The Journey through the Clouds Excursion begins with an overnight stay in Vancouver each Monday or Thursday from April 15 to October 10, 2019. It begins with a transfer from the Calgary Airport to Banff on each Monday and Thursday from April 15 to October 10, 2019 as well. In 2019, this package is renamed the Journey through the Clouds Excursion. In 2017 this package was named the Western Explorer Excursion. 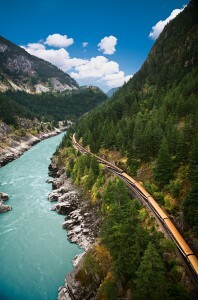 GoldLeaf Deluxe – GoldLeaf Service on the train with upgraded rooms at hotels. Alcoholic and non-alcoholic beverages are included.